Sometime, people underestimate the power of a smart phone. The developers have made an app for literally everything. There are apps for clicking awesome pictures with your smart phone. Apps that you can use to talk anyone for free. Hence now here is the list of apps that let you measure the distance with your android and iOS mobile phone. You can use these apps to know the distance from point A to point B. Hence you will have the idea of the time it will take you to reach there. These apps can be really handy apps when you are in the new city or visiting any new place for outing. As a result of which it would be essential for you to know the distance and these apps will help you in measuring the distance. If you are an iphone user and wanting to measure any distance, then you can blindly trust this app. YOu can use this app for map measurement and distance measurement as well. This app has got measurements in all unites like Acres,Ares,Hectares,Square Feet,Square Yards,Square Meters,Square Miles,Square Kilometers. It is easy to navigate and record the area units. This is pretty clean and simple app for your iphone. When using this app, you need not worry about the accuracy of the system, this is tried and tested app that has been used by thousand of people around the globe. You would be able to measure the literal distance between the two points located anywhere on the Earth. Another great app in this list of top best apps to measure distance is Easy Measure. This app is for both android and iOS users. It will show you the distance of the object from the lens of the camera. With this app you can measure the length of the building, or as a golf-aid etc. 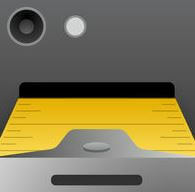 Easy Measure is completely free to use app with all the features included. This is super easy app with retina display. You can share the results, celibate the app. This app also supports the metric system and imperial units. The developers have also added an amazing the demo which is very interactive and you would be able to understand the app’s functionality. Do you want to measure the distance from point to point between any two objects ? If yes, then this is the app for you. This app has a map, hence to measure the distance you would be needing the internet connection. You can have the result in feet/yards/miles or meters/hectometers/kilometers. It is very easy to use this app. You can tap and hold to set the initial location, then enter the destination for measuring the distance. The developers have also provided a manual that you can use to know about all the functionality of the app. The app also have the search functionality that you can use to search for any location as well. If you are looking for really a killer app for measuring distance, then this is the nice app for you. It measures anything from area and distance till all the perimeter management works. 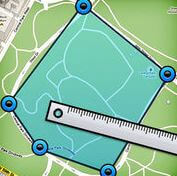 You can measure the fields, mark the distance and also can share it with friends and anyone using the sharing options. These options make this as one of the best apps yo measure distance. It has got rapid measuring algorithm for distance monitoring. It has also got walking / riding distance- time calculator. The best option that I personally like is that you have the option to send direction or route to any one using the customized link generated. This is the application that you can use to measure the distance between the two points anywhere on the earth. All you need to do is to open the app and place the first marker and then tap for the placing the second marker. After this, you would be getting the distance between the two points. You also have the option to find the distance between the series of locations. For that you need to place multiple markers and you are good to go. You would be given the exact distance between the points. For map purpose, you would be able to change the views of the maps like Normal, satellite, terrain, hybrid. The source of these maps are from Nasa library, which could be taken as authentic information source. This is a little different kind of application. It is kind of app that you can use for measuring the distance of the objects. It measures target using trigonometry concepts. All you need to do is to stand up and press the shutter. You have to aim the camera at the ground so that the app can measure the distance from the bottom to the top of the thing that you are measuring. The measurements are very accurate. Hence you can be really sure that you are doing the right thing. If by chance you think that the app is not calibrated, then you can follow the instructions and calibrate the app and again follow the same process. 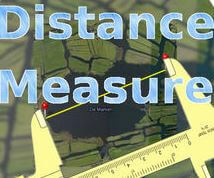 This is simple and easy to use app that you cab use for measuring the distance.